Hey hey! SO do you LOVE or LOVE this crushed panne?! You’re probably thinking, “It’s gross, I hate it” (Husband’s opinion) and that’s ok. 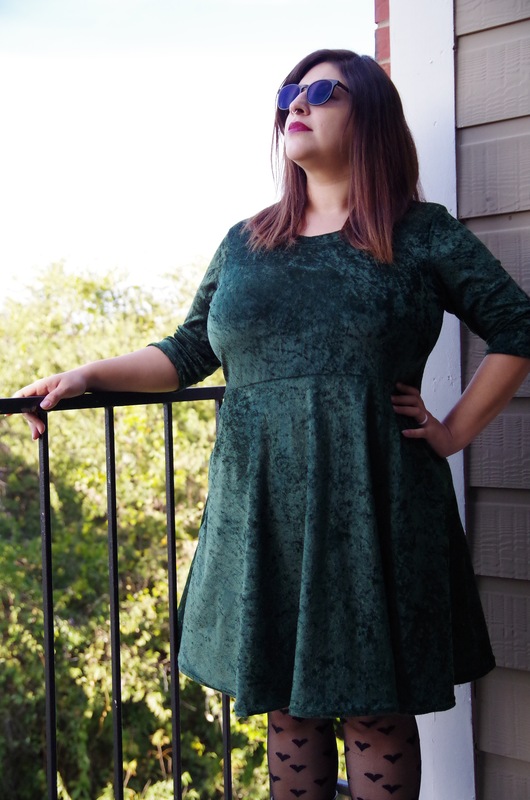 This wasn’t the best material to sew with but I’m enjoying my new “Christmas” dress (my coworkers have been saying it’s a Christmas dress for SO long now LOL). Here’s my mash-up of two patterns. 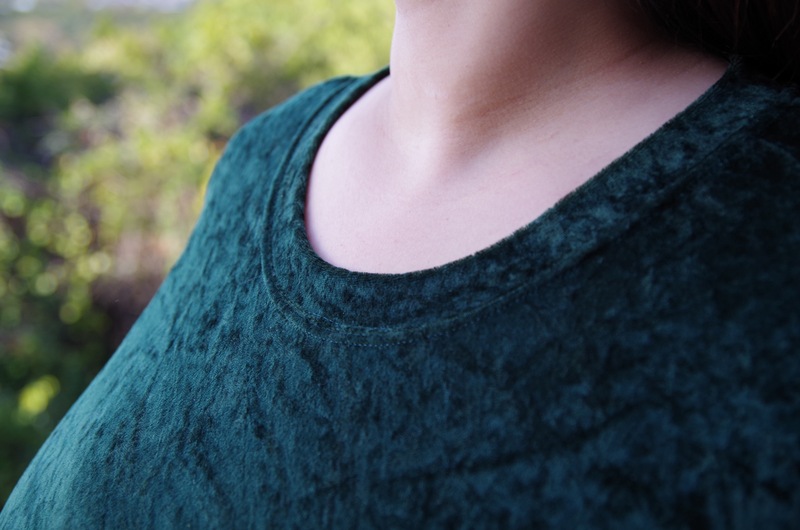 Close-Up of the neckline. Twin needles for life. I purchased this fabric at Hancock Fabrics for $7-2 yards. Not bad for a whole dress! I like the backside of the dress. I feel it’s flattering to my shape. 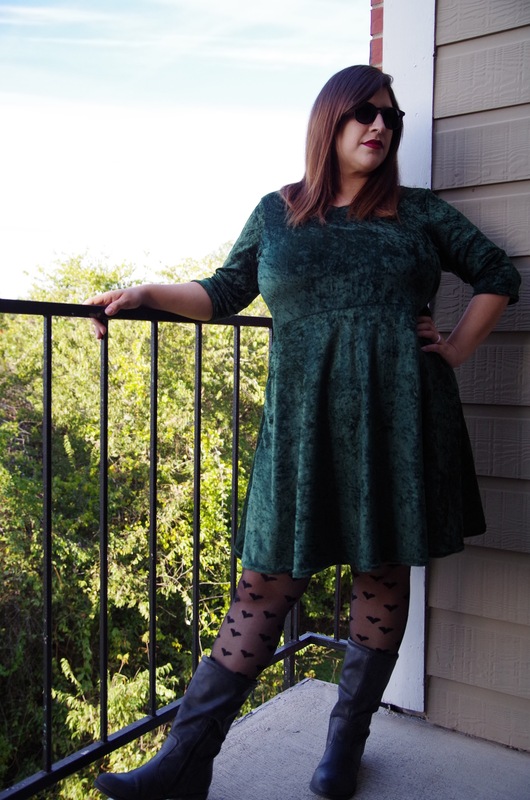 While I won’t make another dress from crushed panne, I will definitely find a suitable knit to make this again. The bodice is the Sweetheart Knit top (yes I’ve made this top NUMEROUS times) from Gertie’s book, Gertie Sews Vintage Casual, size 16 altered to add an FBA only.Looking at the back pic I can see that a slight Swayback adjustment woul’ve help a tad. Next time! The skirt is from the BlueGingerDoll pattern, Violet and I cut a size 20. Construction was easy enough but crushed panne can really jam up your sewing machine. Fuzzies everywhere. Thanks! I love/hate the fabric lol! I like it and I think it looks great in it. That’s a flattering dress and I love it on you! Another great piece. You have a beautiful wardrobe now. BTW, digging the stockings, mi’lady. It is totally a christmas dress! LOL. Another great piece!